We love the flattering details of this dress. The Taupe Belted Flutter Sleeve Dress With Dimensional Pockets is made of a crêpe chiffon fabric and is lined below the waist. It has a rounded neckline and flutter sleeves. The classic sheath cut is updated with adorable dimensional side pockets that stand out from the dress. An included black belt with a gold buckle wraps around the waist and buckles in the front. An exposed back zipper completes this cute little dress. The Taupe Belted Flutter Sleeve Dress with Dimensional Pockets would look great with black pumps or heels. Details: Lined below waist. Exposed back zipper. Belt included. 100% polyester. Dry clean. Do not bleach. Cool iron. No tumble dry. Small measurements: Length from top of shoulder to hemline: 34”. Bust: 34”. You have added Taupe Belted Flutter Sleeve Dress with Dimensional Pockets into Wishlist. You have added Taupe Belted Flutter Sleeve Dress with Dimensional Pockets for Stock Notification. You have set Taupe Belted Flutter Sleeve Dress with Dimensional Pockets as a loved product. 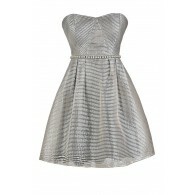 You have removed Taupe Belted Flutter Sleeve Dress with Dimensional Pockets as a loved product.